Cheng is the fifth death row inmate to be released from prison for a retrial, including the Hsichih Trio case of Su Chien-ho (蘇建和), Liu Bin-lang (劉秉郎) and Chuang Lin-hsun (莊林勳), who were found not guilty in 2012. 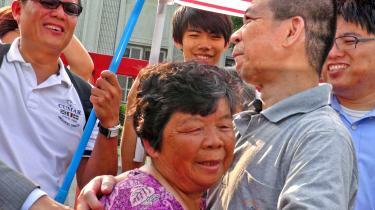 …A retrial was ordered after Cheng’s defense team presented new evidence raising doubts about his conviction..
Cheng Hsing-tse, right, embraces his mother in Taichung yesterday following his release from death row yesterday pending retrial. The Taichung Branch of the Taiwan High Court yesterday ruled that death-row inmate Cheng Hsing-tse (鄭性澤) should be released on bail pending a retrial on the charges that have seen him imprisoned for 14 years, including 10 on death row. The 49-year-old Cheng, who has always maintained his innocence, walked out of the Taichung Prison in the afternoon and was met by family members and supporters, including representatives of the Taiwan Association for Innocence and the Taiwan Alliance to End the Death Penalty. “I have been imprisoned for the past 14 years, but now I am so happy that I can spend this Mother’s Day with my family,” he said as he embraced his mother. Cheng’s attorney Law Bing-cheng (羅秉成) said the day has been late in coming because his client is innocent and has been jailed for too long. “Today he is set free, and for this we have to thank the prosecutors and the judges. This case has also set milestones in Taiwan’s judiciary, because it is the first time that a man whose death sentence was upheld by the Supreme Court is going to receive a retrial. I am certain Cheng has the courage to face the retrial so that he can clear his name,” Law said. Yesterday’s decision barred Cheng from leaving the country or going out to sea. Cheng’s case has gone through seven trials and seven retrials, including the Supreme Court upholding his death sentence in 2006. A retrial was ordered after Cheng’s defense team presented new evidence raising doubts about his conviction for the death of police officer Su Hsien-pi (蘇憲丕) during an exchange of gunfire at a KTV parlor in Taichung in 2002 and prosecutors concurred. The prosecutors’ application in March for a retrial was the first time in the nation’s history that a retrial has been sought in a case where the Supreme Court’s final ruling upheld the original death sentence. Human rights groups have long highlighted what they said were defects in the original investigation and questionable evidence used by prosecutors, including a confession that Cheng had been tortured and coerced into making.